an interesting combination of nemo (n’eastern blizzard of ’13) nyfw and valentine’s day preparations have descended upon me this weekend. in the banal world of lash curlers, help has arrived: chanel recourbe cils de chanel precisioneyelash curler. i am partial to anything from the house of chanel. And this little luxury elevates one’s makeup bag with a certain je ne sais quoi. my clarisonic mia has just found its soul mate! i am quite fickle about skin care. i jump at any promise of smooth, exfoliated skin. -even a hint at results i would expect from microdermabrasion sends me into a tizzy. well let’s just say olay professional pro-x exfoliating cleanser exceeded my expectations. i could not be more excited about being snowed in because i will be gorging my senses (not to mention the long list of comfort food)with my diana vreeland: the eye has to travel dvd. 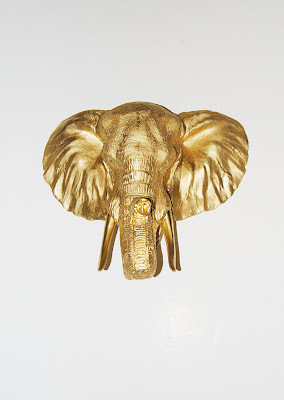 say hello to my new little friend, ella the gold elephant! (i named her already). she will be adorning my bar cart area. will post pics when she is ensconced at home.